This week's issue of Famitsu Weekly contains a short feature on Kingdom Hearts Unchained X, releasing in Japan next month. With the clock is winding down to the game's release, Famitsu elaborates on the gameplay changes being made to the game, such as strengthening Keyblades and avatar customization. 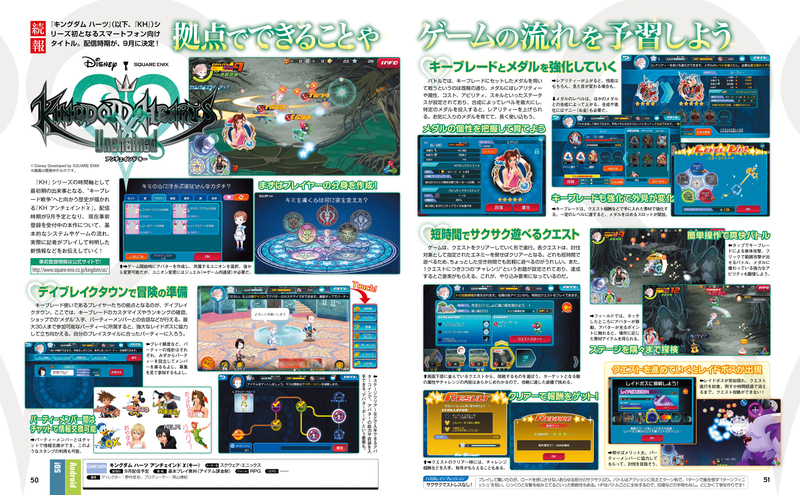 The feature also contains new information about the Avatar Board messaging system. Clearing stages in the game will allow players to earn Avatar coins, which can be redeemed for costumes and abilities. The Avatar Board also utilizes stamps similar to the ones released for the popular messaging application, LINE. A smartphone title comes to the KINGDOM HEARTS series for the first time. Determined to be released in September! In the earliest event in the KINGDOM HEARTS timeline, KINGDOM HEARTS Unchained Chi draws on the history of the Keyblade War which is planned for release in September. This title is currently accepting pre-registrations. Concerning the basic system and game flow, the reporter will share new information found while playing. First, create your player avatar! Once you create your avatar in the beginning, select a union you want to belong to. It’s possible to change it later but changing unions will require Jewels (in-game currency). For Keyblade wielders, Daybreak Town is a hub for players. Here, you can do Keyblade customizations, confirm your ranking, shop for “Medals”, and party member conversations can be performed. Up to 30 people max, it’s possible to join parties, and team up to challenge Raid Bosses. You can form a party that matches your play style. Play frequency, party rules, and so forth. You can recruit members into your party and you can also look to see which ones you can participate in. It’s possible to exchange messages between party members in chat. Party members can exchange information and stamps are also available. After clearing stages you can obtain Avatar Coins, avatar abilities and costumes in the “Avatar Board” can be obtained. In battle, it was previously reported that medals are set in the Keyblade in order to fight. The medals have rarities, attributes, cost, ability, default skills & statuses, can be leveled through synthesis, and when you put a specific medal, its rarity can be increased. Continue to use and train your favorite medals. When its rarity increases, its performance also does, and even its appearance can be changed. Medal levels can be increased by synthesizing it with other medals. Munny is important for synthesis and evolution. Materials can be obtained from quest rewards used to strengthen the Keyblade. When it reaches a certain level, a medal can be placed in an unlocked slot. In the game, you must continue to clear quests in order to progress. Each quest becomes clear when you defeat a specified enemy. In regards to playing for a short time, I’m glad that I can play it casually. In addition, there are three challenge settings per quest and you can win rewards for those achievements. This has become a speedrunning element. Tap to use a simple attack and flick to use a range attack. Powerful abilities come from medals the way they are commanded. In the field, your avatar will move to the position where you touch. Touching an area that glitters near your Avatar, you can obtain materials depending on the location. Quests are lined up on the bottom of the screen, and choose one you want to challenge. Details of the Target’s attributes and challenge are shown in advance and you can see if your equipment is suitable for battle. When you clear a quest, you obtain the challenge’s rewards. You can also earn a title. A Raid Boss suddenly appears and it interferes with the quest progression. Until it disappears under a certain time, it’s not possible to exploit the quest. There are benefits for defeating it. Have strong party members take it down. Let's just hope it gets an international release soon. We need it to be announced for other territories besides North America first. I'm liking that you can replay the missions, that's fun. The Avatar Board looks pretty interesting, like a Stat Matrix Lite. Here's hoping the extra objectives aren't garbo like Days's Challenges were. Am I interpreting it right that it sounds like each Medal has two attacks (tap and swipe)? Looks like LUX has a level attached to it too. Wonder what that means. A touchscreen game I might like if only I can learn to play it. The chat thing seems cool too. This game looks better by the day, I wonder what difference the avatar board will make, but I think it can only improve the gameplay in a meaningful way. From the looks of it you have to fill the ability bar to use the special attacks (swipe) of your medals. I'll be happy once I hear/read news that it's coming to the EU as well. We always get left behind, not cool! With the German SquareEnix employee hinting at this game months ago on Facebook I think an EU release is basically a given, even if it wasn't officially announced yet. Does anyone know if you can play this on an ipad as well or will it be just for smart phones? I'm so excited for Kingdom Hearts Unchained, it's the KH MMORPG I always dreamed haha.